My Canyon Nudes began after some stormy days and scary adventures while on a houseboat trip at Lake Powell. Struggling to find our way in a small motor boat in high seas and later experiencing a flash flood, my companions and I were made personally aware of the fragility of human existence within the powers of the natural world. 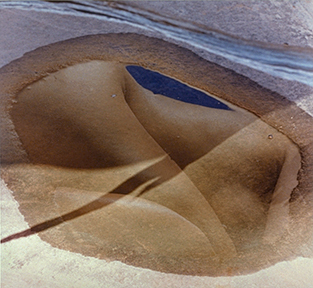 When I began photographing the human form in the sandstone context, it was as a shadow or reflection only. We, like the generations preceding us, were only tenuous presences passing through while the land bore witness. To make the images, I found or poured pools of water on rock or clay. Reflections, my primary vehicle for merging flesh with land, show up well only in shade. At first, I included sunlit sandstone reflected in water because it evoked flesh. Later I added sun on the figure or entering the scene. So most of the images combine sunlight with bluer shade, resulting in a surreal and unusual color palette. Pushing the sense of a unique world further, the images are turned upside-down, so that the reflections appear to be actual bodies. My goal as I worked was to have the images exist within their own space and reality, so that they made as much sense, or more, turned around as they did the way they were shot. I combined shadows, sunlit areas, sticks and their shadows, and found that the more I added, the more the images welcomed the complexity and evolved. Sometimes, sunlight entering the shaded scene transformed it. The sunlit portion of the body reflection looked like a fossil. Sunlight also erased the edge of the puddle so that a body could appear to be emerging directly from primordial ooze. Reflections join with the substance the water is poured onto and take on its character. Thus, body reflected in rock seems to be a geode or fresco. Reflected in clay, it appears to be a shard of life.